This article, the third of three about the 2014 Atlanta International Gift & Home Furnishing Market, is about the art trends seen at the show. Read the first article "Art Licensing: 2014 Atlanta Gift Show - the amazing AmericasMart campus" for information about the AmericasMart and how a person can attend the gift show; the second article "Art Licensing Editorial: 2014 Atlanta Gift Show - insights on walking the show" and the importance of observation, asking questions to learn about the art licensing industry and improve your art. Art themes that started as a trend and have proven over time to be consistent sellers of products are considered to be evergreen (timeless). These themes are seen on all kinds of products. They include flowers, birds, butterflies, cats, seashells, lighthouses, palm trees, Adirondack chairs, roosters, grapes and wine, pumpkins, fall leaves, turkeys, snowmen, snowflakes, Santa, Christmas trees, poinsettias, and ornaments. In these challenging economic times, retailers depend on evergreen themes to entice consumers to purchase their products. Often when manufacturers ask artists for new art they do not mean a new theme but a new look of existing themes. Still, every year new themes do appear, stay awhile, and then eventually disappear. And, some are fads and disappear much quicker. Words and sayings are still popular but the way they are presented seem to change constantly year after year. At Atlanta there was a peoria of words on distressed wooden signs and of course the latest craze - the chalkboard look. Owls have been hanging around for several years. The prediction by experts when they first became popular was that they would soon disappear does not seem to be the case. There were plenty of owls on products at Atlanta. Flip-flops, chocolate, coffee and high heels are still popular but not as much as in previous years. Cupcakes themes seem to have ebbed and cakes are again number one in popularity for birthday themes. In the past, art directors only licensed non-breed specific dog images. But, at Atlanta I saw several showrooms with a collection of breed specific dogs on products. And, miniature gardens seem to be expanding. There were many garden decoration showrooms displaying their versions of miniature gardens. The Christmas decorations at Atlanta were full of lights and elegant sparking decorations. Glam was in with all sorts of color combinations including Pantone color of the year "radiant orchid". Note: I only walked the aisles on one of the five floors of the Holiday and Floral home décor floors at the show. And on that floor, the traditional red and green Christmas decorations were not evident in the showroom windows but may have been displayed inside. Even though poinsettias is evergreen as a Christmas flower, gift products at the show often used the amaryllis flower instead. Last year Santa images were predicted to exceed snowmen this year but my overall impression at Atlanta was snowmen are still the predominate image for the winter / Christmas season. Many experts think that the reason is that it can be used for the longer winter season and not just Christmas. Below are discussions about the latest trends - chalkboard style designs, vintage and woodland themes. Note: In the discussions, I refer to several articles. The links to those articles are listed in the Trend Articles section of this article. The chalkboard art style were on products in many showrooms at Atlanta but of course not in every showroom depending on the products sold. And, if the chalkboard style was not used on products, it was often on signs to advertise the products the exhibitor did sell. But so far, the style is used on a limited amount of product types such as inspirational words and verses for wall décor and for greeting cards. It may not be suitable for such products as jig-saw puzzles, decorative flags, and tabletop wares. However, industry experts have been surprised many times on what appeals to consumers so who knows how far and how long this style will continue. Note: Since the chalkboard style has spread so fast, it is considered a fad and may not be able to sustain itself. Art styles and themes that take at least several years to grow and mature tend to last longer. Consultant J'Net Smith stated in her article "AmericasMart Showcases Licensed Art Themes on 2014 Product Lines" that "Chalkboards are now, in my estimation, too much of a good thing." 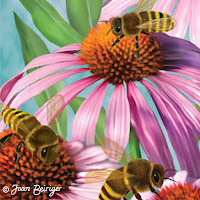 And, art licensing agent Jim Marcotte commented in his article "Runnin' Wild in Atlanta", ". . . it is so pervasive now that they have all morphed into the same look and feel so you absolutely cannot tell one company's from another. Usually that means bye-bye trend." 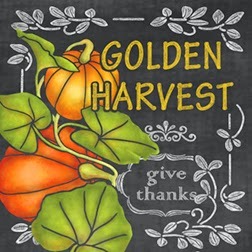 But, for now some artists are having success in licensing their chalkboard designs such as Valerie McKeehan. She used her talent to get several multi-SKU deals as shown in "Americas Mart Atlanta Re-Cap January 2014". When news that woodland animals were a new trend spread between the art licensing community, artists were fast to respond and created all kinds of woodland creatures. So far many are having little success in licensing any animal other than what was recently popular (squirrels and owls) or is currently popular (red foxes) but that may change according to Hillary Belzer of The Makeup Museum in "Mini-trend: woodland wonderland". The current trend of red foxes were definitely seen on products at Atlanta. And, it looks like the woodland trend is mostly for the illustrative, stylized, and whimsical art style and not the fine art style as fine art artists discovered when they tried to license their woodland creations. And what is the latest woodland animal craze? Hedgehogs is the answer according to Hillary Belzer. But wait, does the U.S. have hedgehogs? No! So will American consumers purchase products that has an animal on it that they do not relate to? And, will American manufacturers even license hedgehog art? All we can do is wait and see. The vintage trend is alive and well. All kinds of vintage looks were seen in the Atlanta showrooms. But, what is referred to a vintage trend for products right now can be confusing because the word vintage is often exchanged with the word retro that refers to anything before the present. And, people often define the meaning of vintage differently. Some think of vintage as distressed patinas on wooden items, or the look from different eras, or even antique reproductions. And, all the looks were prevalent at Atlanta. However, currently the term "vintage trend" refers to the 1950 era with its simple graphic art style and vivid color combinations. The fifties look on products at Atlanta had minimal designs, clip art from the fifties, reproductions of art and themes from the fifties, and art using the fifties style on popular current themes. See Gifts and Decorative Accessories "Direct from Market: Atlanta, January 2014", and The Parable Group "Atlanta Gift & Home Show" for examples of the vintage 1950s trends seen at Atlanta. • Gifts and Decorative Accessories (magazine) "Direct from Market: Atlanta, January 2014"
• Giftware News (magazine) "Atlanta January 2014 Market Reaches New Highs"
•Jim Marcotte (agent of Two Town Studio) "Runnin' Wild in Atlanta"
• J'Net Smith (consultant of All Art Licensing) "AmericasMart Showcases Licensed Art Themes on 2014 Product Lines"
• Hillary Belzer of The Makeup Museum "Mini-trend: woodland wonderland"
• Sally Ross (marketing and communications strategist) The Parable Group (marketing) "Atlanta Gift & Home Show"
• Valerie McKeehan (chalkboard etc. artist) "Americas Mart Atlanta Re-Cap January 2014"
Listening to retailers, manufacturer art directors, art licensing agents etc. gives you insight about the economy, the different markets, and the art licensing industry. A must read article is "Snippets - Talking It Up In Atlanta" by art agent Jim Marcotte of Two Town Studios and the snippet guru who really listens! As J'Net Smith stated in "AmericasMart Showcases Licensed Art Themes on 2014 Product Lines", "My formal take-away from this year's show was that there were 'no new themes.' " And, that was the consensus of many people attending the Atlanta Gift Show. But, it would be hard to spot any new themes that could be emerging because the spotlights were definitely on chalkboard art style and ALL the vintage themes. Showrooms with those products were busy, very busy! 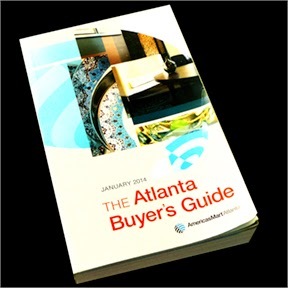 The Atlanta Gift Show was a success according to the AmericasMart press in "Market Bulletin: January 2014 Market Reaches New Highs". And, even though Jim Marcotte thought that the traffic was down from previous shows he stated in his article "Runnin' Wild in Atlanta" that ". . . the Word of the Week was "positive". Everybody we met with (and in 5 days of running we met with a lot) was up, they were happy with the way the market was going, the customers were buying and they wanted to talk product". That is very good news!!! This is the second of three articles about the Atlanta International Gift & Home Furnishing Market. As the title to this article implies, it really does mean that by attending the show you do walk it which can be hard on your feet since the AmericasMart campus is huge. So, wear comfortable shoes or you will not be able to see much of it. The purpose in going to the Atlanta Gift show is not only showing art for licensing consideration and getting contact information from the manufacturers exhibiting but MUCH more! It is also to learn about the licensing industry, learn what kind of art manufacturers & retailers are looking for, and spotting art and color trends. So, you need to observe, talk to whomever you can, and ask questions. Read the first article "Art Licensing: 2014 Atlanta Gift Show - the amazing AmericasMart campus" for information about the AmericasMart and how a person can attend the gift show. Walking the show can be exhausting and it is easy to get overwhelmed with information and looking at "eye candy". The floor to ceiling glass windows of the showrooms allow you to see an amazing number of products as you walk down hallway after hallway after hallway. And do not presume that because a showroom is empty of buyers that the manufacturer is having a bad show because ten minutes later it can be packed with buyers. For some unknown reason, people attending any type of show seem to move through them in packs. Hint: I found it helpful to take plenty of breaks to relax from sensory overload and write down notes on what I saw and heard. Note: The AmericasMart policy does not allowed photos to be taken unless permission is given by the exhibitor. Attendees are allowed to bring rolling briefcases or rolling laptop size cases but nothing larger. But, these still tend to be a tripping hazard and gets in the way. Most people carry tote bags or backpacks for literature and other items. Not all manufacturers have their own permanent showrooms at the AmericasMart. Some use a distributor(s) that have showrooms, some have temporary booths during the shows, some have permanent showrooms and also use a distributor, or use a distributor and have a temporary booth. Thus, you may see products from the same company in several showrooms or booths. Persons responsible for selecting art for licensing consideration (art/licensing director or owner of the company) attend the Atlanta Gift show for at least two or three days of the show. They do not often go to the smaller regional gift shows. Because many art directors ( but not all) attend the Atlanta Gift Show and it is the largest one in the United States, it is the best one to attend to search for licensing opportunities. If you have contact information for the person responsible for selecting art, it is possible before the show to make an appointment with her/him IF she/he is attending the show and making appointments. While walking the show, always look at showrooms that appear to have licensed art and products if you are interested in licensing your own product concepts. Ask at the information desk in the showroom if they license art and also ask who to contact and for their email address. It is smart to have with you an iPad with your art on it. You may have the opportunity to show your art to the companies art director or owner. The iPad is easier to carry than a large portfolio and an art director can easily flip through the images while standing in a crowded showroom or booth. Also, approaching manufacturer art directors are great ways to start building relationships that are very important in licensing your work. But, remember this is a wholesale show and you MUST observe show courtesy. The exhibitors are at the show to sell products to buyers so wait until the person is free before asking questions. There is a lot of information available just by looking at the art on the products in the showrooms and booths. What colors and art themes are manufacturers placing on their products? What art styles are they using? And, is your art a good fit for their product lines? Do not waste your or the manufacturers time showing art to manufacturers that is not a good fit! For example, if you create whimsical styled art, it is a waste of time showing it to a manufacturer that ONLY wants contemporary graphic art styles or a weathered looking vintage art style. Be on the lookout for new themes of images that appear on numerous manufacturer products. This could be possible trends that are at the beginning of a trend cycle and could continue for several/many more years OR not. And, when you are in a crowded showroom observe what products the buyers are looking at and commenting on. Also notice what products the buyers indicate to showroom reps they want to purchase. Every bit of knowledge leads to insight on the art that buyers think their customers will buy. And, that will help you decide on the art themes to create that will have a better chance in getting licensed. Note: I attended two of the home decor seminars for buyers that were sponsored by home décor exhibitors. These seminars were given by expert and well known decorators. Several have their own HGTV home décor shows. The reason why I attended was to listen to their opinions about décor trends seen now in the market, about upcoming trends, and also to ask a few questions. Some home décor trends do filter down into the gift industry so the speakers opinions were insightful. Talk to everyone - manufacturers, fellow artists, art licensing agents, reps and owners in the showrooms and booths, and even buyers. Asking questions is a fantastic way to learn about products and art that sells. Put on a thick skin and ask art directors when they review your art why they do not like certain images of yours. Many are very frank with you and the information gain from that is HUGE. It gives you information on how to improve your work (technique, themes, colors etc.) so that you can create more licensable art. Artist and art licensing agent Ronnie Walter of Two Town Studios emphasized the importance of this in an artist Tara Reed Art Licensing Info Ask Call*. To paraphrase Ronnie, You need to listen very carefully when art directors are willing to constructively critic your work. Art licensing agent Jim Marcotte also of Two Town Studio and Ronnie's husband agrees in his blog article "Runnin' Wild in Atlanta" with the statement that getting the opportunity to get immediate feedback from the people who make the final decisions in choosing art is a great education that you cannot buy. * Download a free audio recording of Ronnie and Tara's discussion at "Ask about Art Licensing". While waiting to see an art director, talk to a rep if she/he is not busy. Reps like to talk to people about products and they may share information about the company and artists they license their work from. Information such as what art are big sellers and why they (the manufacturer) like to work with certain artists (easy to work with; knows what art consumers buy) would not be found out otherwise. And, even talking to buyers gives you an understanding about the retail business and what sells. At the show, I spent an enjoyable 45 minutes talking to a gift store owner while i was sitting in line waiting for artist Susan Lordi (Willow Tree) signing at the Demdaco showroom :) I learned a lot about the challenges in running a store in this changing economy. Hint: For those of you that have a hard time approaching reps and showing your art, I will let you in on a little secret. It is hard AT FIRST but it gets easier the more you do it. I am an introvert and meeting strangers are VERY outside my comfort zone. When I started attending trade shows years ago, I had to force myself to approach a booth. It was agony. And, low-and-behold I found out that usually the reps were really nice. And, I learned not to take it personally when they were not nice. So now after years of practice, when I walk the shows I put on my social hat and actually enjoy meeting and talking to strangers. I am still an introvert and prefer staying in my studio creating art but I have learned that occasionally leaving my studio and meeting other people is not only enjoyable but can be educational. Below are a links to articles by others attending the show. • Andrea Brooks and Dennis Kendrick "The Atlanta Show January 2014"
• Beth Logan "Atlanta Gift Mart 2014"
• Genevieve Gail "Atlanta Gift Mart Recap"
• Kathy Weller "AmericasMart 2014 trip and Demdaco Yoga Pals"
• Linda McMullan "Report from Atlanta Gift and Home Market" and "More Trends from the Atlanta Gift and Home Market" and "Three Big Lessons from The Atlanta Gift and Home Market"
• M & M / art baking "Atlanta Gift Show January 11, 2014"
• Patti Gay "Atlanta Gift Show"
• Rhoda (consumer) "The Atlanta Mart January Show"
• Stephanie Ryan "Atlanta Gift Mart Recap Part 1 – Fleur for Magnet Works – Studio M" and "Atlanta Gift Mart Recap Part 2 – Santa Barbara Design Studio"
• Valerie McKeehan "Americas Mart Atlanta Re-Cap January 2014"
• Working Girls Design "2014 Starts off Right - Our Trip to the Atlanta Gift Show!" It is expensive to attend the Atlanta Gift Show because of airfare and lodging costs. So, use your time wisely in walking the show to learn as much as you can. Wear comfortable shoes, bring an iPad with your art on it, and a camera or smart phone to take pictures if you have the opportunity. Also do not forget to bring some business cards and postcards with your contact information on them. Pick up literature and magazines from the magazine racks situated near the elevators and escalators on each floor to peruse after the show. You can ask the manufacturer for catalogs but I found that not many will give them to artists because they are saving them for the buyers. Talk to everyone, ask questions and build relationships. And, learn as much as you can so that you have a better understanding about the licensing industry and thus a better chance in licensing your art. This is the first in several articles about the 2014 Atlanta International Gift & Home Furnishing Market that sells product to retail stores. 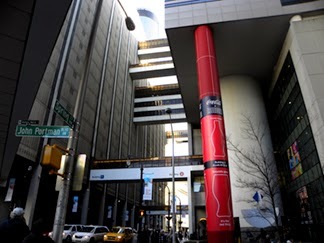 The January and July Atlanta Gift Show each year is the largest in the United States and held at the AmericasMart campus in downtown Atlanta, Georgia. It has more than 1400 permanent showrooms and during the shows 2500 temporary booths housed in three buildings (sometimes called four buildings because of the addition to building two). The above picture of the 774 page tome of the buyer's guide attests to how many companies showed their products to buyers. Note: This year the Mart installed free WiFi in all buildings and floors. As you would expect, not all areas had a strong signal and so the speed and connections were sometimes iffy. The Mart also installed an app that could be used with smart phones and tablets for locating exhibitors. I found the app not reliable, slow and difficult to use on my iPad so I finally gave up and instead used the buyers guide. Artists attending this show get contact information, meet with art/licensing directors to show their art for licensing consideration, and get inspiration by looking at all the products. Because the show is a wholesale trade show for buyers, artists are only allowed to attend if they qualify for the Marts admission policy. Artists can be a guest of a company exhibiting at the show*, a guest of a buyer attending the show, a buyer if the artist owns a business and qualifies as a buyer, as press (some bloggers have been able to quality), or as a rep for several artists. To find out more about qualifying, read "Admission Policies" and "Press Registration / Credentials". * If an artist has a licensing deal with a manufacturer exhibiting at the show, the manufacturer normally is willing to get the artist a badge to attend the show. Connecting bridges among the three buildings on certain floors allow show attendees to walk among the buildings without going outdoors. Shown in the photo are the bridges between building 1 and 2. The AmerciasMart campus is huge. Building One has 23 floors, Building Two has 18 floors, and Building Three has 15 floors. 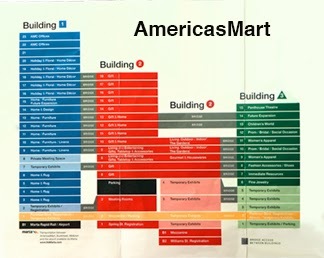 The above schematic of the buildings show what floors the bridges connect to what buildings and a general description of what products are in the showrooms on each floor. Building One has showrooms of home and rug, furniture and linens, home design and décor, and holiday and floral. Building Two showrooms have gift and home, and outdoor / indoor products. This building has most of the companies that license art. Building Three has showrooms of apparel and jewelry. Temporary exhibiting booths are on certain floors in all three buildings. The elevators especially in Building Two are used a lot and not the fastest way to go from one floor to another. So many people use the escalators or even the stairs. 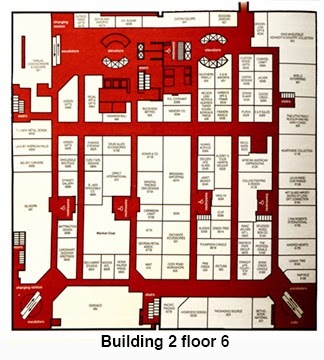 The above schematic shows the location of the elevators, escalators and showrooms on floor six Building Two. Floor six tends to have the heaviest traffic in Building Two probably because one set of escalators stop at this floor. To go up to the other floors a person needs to walk across to the other side of the building to get to the escalators that go higher. Traversing Building Two and looking for certain showroom numbers are frustrating because of the addition to the building and enlarging floors six, seven, eight, nine and ten. The showroom numbering system is no longer sequential. A person walking down an aisle toward a destination of for example showroom 631 discover that all a sudden the showroom numbers changed from 627 to 685. The only way to find showroom 631 is to look at the floor schematic. Not all exhibitors license art or products. Some companies have no art on their products, some have the art on them but do not license the art, and some are distributors that represent various manufacturers that may or may not license the art on the products. So if you feel your art is a good fit for the company product line, it means asking if they license art. I was very surprised that many more exhibitors than I expected do license art. And, some were even willing to look at art when I asked for contact information. In situations like that, it is imperative to have your art on an iPad because not all exhibitors have room for a table to spread out a portfolio. With an iPad, art can be flipped through quickly while standing.